I know today is usually a video day, but I kinda took the weekend off and did a little scrapping for the family scrapbook. Today is our 13th wedding Anniversary. So Happy Anniversary to my hubby. 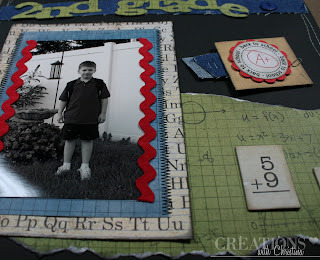 I'm working on my 2009 scrapbook...This is Ethan's first day of school from last year. I used my new BoBunny Learning Curve paper for some of the elements and the background is a plain black cardstock that I crazy stitched around the border. "2nd Grade" is cut from Plantin School Book on my Cricut and the tag with "Back To School" circle sentiment is from The Cutting Cafe. I'm so glad you did a scrapbook page to share...this is terrific!! Love all the elements...especially that crazy stitching...TFS! Happy anniversary! Love the page! Very nice layout which will be looked at fondly over the years. Love this scrapbook page. Since I don't do Halloween, it is good to see other types of pages and ideas. Happy Anniversary to both You and Hubby. Congratulatons on your Anniversary! I hope you have a wonderful day. I love this layout, it is so adorable! Great page! I love the stitching. Happy Anniversary to you and Scott! Enjoy your special day. Ihope you had a wonderful anniversary! Love the layout! Handsome young man! This is a great page. I love the little flash cards. Happy Anniversary! Celebrate with a Bang! Great memories page. He will enjoy this all his life. Happy Anniversary to both of you and may you have many many more. My 50th is coming up next June, yahoo!! Great Layout Christina. Your son will treasure it forever. Happy Lucky 13th Anniversary. Do something special. What a fantastic layout. 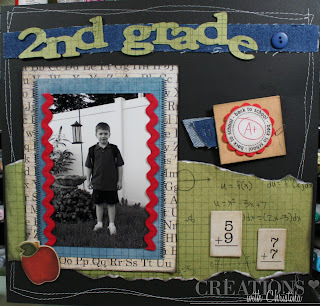 I am a 2nd grade teacher and I am going to make layouts for each of my students...great inspiration! Happy anniversary to you both. The page is too cute. Thanks for sharing. Happy Anniversary!!! It's our 25 anniversary today also , looks like we share the day ! Great page and a handsome child. Very cute scrapbook page. Happy Anniversary. Have a great day. HAPPY ANNIVERSARY!! Your layout is just TOOO PERFECT my friend! Happy Anniversary! Congrats on 13 years. Happy Anniversary to you and your husband! Hope you had a wonderful day..Love the Layout of your son from last year. My Grandson goes into the second grade, first day tomorrow. Can't wait to hear all about it :-) Have A Great Week!! Happy belated Anniversary and love the layout. The dark colours work really well with the red and green. The stitching gives character to it too. Happy Anniversary. I love the paper & layout is amazing.